Sometimes closer integration than simply hot folders is needed. In that case pdfToolbox provides integration through the command-line (with pdfToolbox CLI) and integration through the SDK (with pdfToolbox SDK). The pdfToolbox Server installation folder on Mac OS X. The pdfToolbox Desktop application installed by the pdfToolbox Server installer. 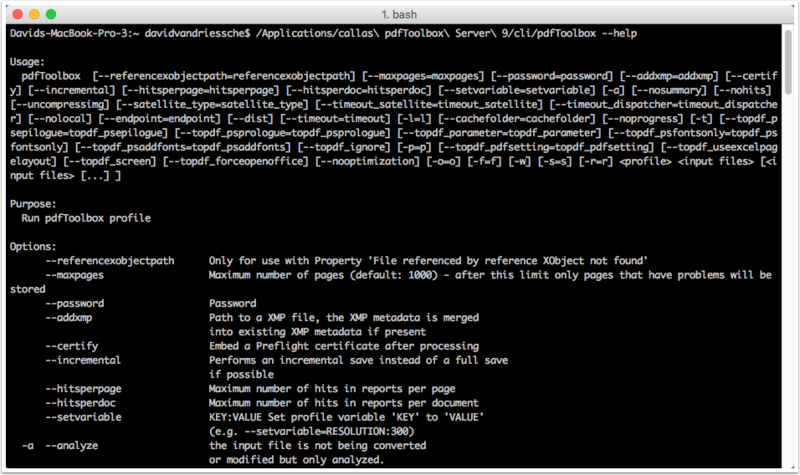 The pdfToolbox CLI application. This is the application that needs to be called on the command-line. The documentation folder for the command-line version. 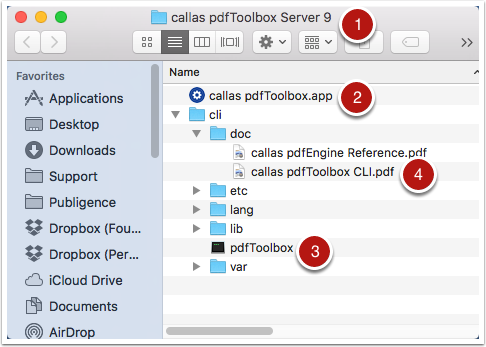 This manual can also be found online: callas pdfToolbox CLI (command line interface). The easiest way to find out what you can do with the command-line, is to run the --help command. 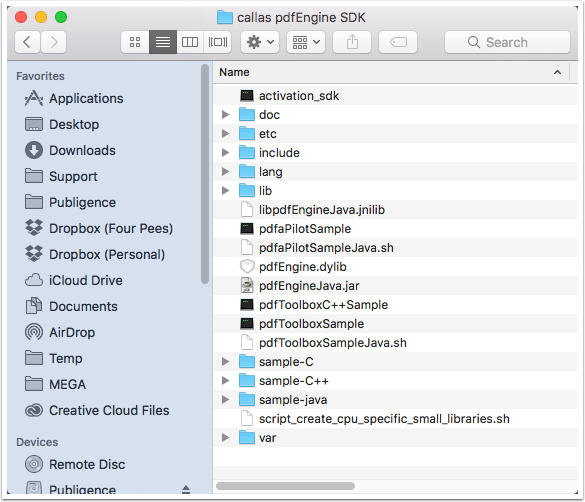 callas pdfToolbox SDK offers a comprehensive programming interface and sample code for thorough integration of pdfToolbox technology into your own solution. It gives in-depth access for analysis and manipulation of the PDF and embedded formats such as fonts, metadata, color profiles, image compression and more. The software development kit for pdfToolbox has C/C++ as its primary development language, but it comes with APIs and example code for other development environments such as Java or .NET. When evaluating whether you are going to use the SDK, you should keep in mind that it comes with sample code, but that the code is not production-ready. You will have to write actual production code to integrate the SDK in your solution.